In the circus, the trapeze artists are the most revered for they have the most frightening acts. Flying through the air with nothing but space beneath you and the next trapeze bar not yet in your reach can be exhilarating or fearful. It depends on the amount of practicing you have done. A good trapeze artist has spent many years in the practice of this art and feels nothing but total freedom when between the bars. That is a wonderful metaphor for your spiritual journey. * Ask for what you want, define your desire. * Choose thoughts that are in alignment with your desire. * Follow inspired guidance and allow the universe to handle the details. Master these practices and you will be exhilarated when you find yourself flying through changes in your life. When the unexpected happens, you will trust that everything is working together for your good. Life is at its most creative when you are in the void not knowing what the outcome will be, but believing it will be good. It is the PROCESS of creating that is most enlivening, not the result, for when it is complete; we will simply have another desire to fulfill. You will never be without desires, wanting to reach beyond where you have already been. That is the exciting nature of life itself. 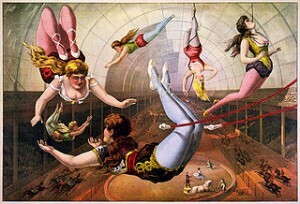 So live in the space between the trapeze bars and enjoy the journey. What is your heart’s desire?? Let’s talk about how you can create your desire.